"The Tropical Marine Biology academic track was incredible! I can truly say I made lifelong friends in the Summer Scholars Program. It really solidified my plans for college and the major I want to pursue. It is a wonderful program!" "My daughter enjoyed every aspect of the Summer Scholars Program. She realized she likes neuroscience as a possible career, and she learned how to navigate life as a college student. For her, the best and most valuable experience was living on campus. She gained a confidence that she didn't know she had, made new friends, and has a new sense of maturity about her." SSP2017JJM from Trevor Green on Vimeo. "This was a great program that really shaped the way I will apply to colleges and where I will consider going next year. The professors I met were incredible and very willing to help me succeed. I made some friendships that I know will last for many years to come." "This program was the best three weeks of my life! I met amazing students from around the world and discovered that we share the same interests. I loved earning six credits in the major I want to pursue, and I gained valuable time management skills that I use every day. I had an amazing time, and I know others will too." "My son loved the program! I witnessed him mature and get a great feel of what college life at UM - or elsewhere - will be like. The program far exceeded my expectations and my son's expectations, and I have never seen him so focused and excited about school!" "The Summer Scholars Program opened my eyes to what college was all about. Not only did we participate in rigorous courses, we had the chance to meet people from all over the world and live on our own. Although the first day I was nervous, Summer Scholars helped me branch out and discover my interests." UM Summer Scholars 2016 from Trevor Green on Vimeo. "Each course I took was highly informative, and they gave me insight into potential majors, as well as careers I could pursue after college. Aside from that, SSP taught me how to manage my time. Overall, I had an amazing experience, and I am very grateful to have attended this program." "I was very impressed as a parent of a scholar who attended the summer program. The program offered a very detailed experience to prepare my daughter for her upcoming year as a college student, emotionally and academically. She expressed excitement going into the program, formed relationships with staff, professors, and peers and felt confident leaving!" "Summer Scholars was life changing for me. It was the best three weeks of my life; meeting new people, living in the dorms, taking college level courses, getting college credit and creating life lasting bonds." "I feel I am better prepared for my freshman year of college as a result of my Summer Scholars experience. My interest in my discipline of study was confirmed. I now have a much better idea of what I want to study and what to expect when looking for, and attending a college." "We are glad we were able to give our daughter an opportunity to experience college life and prepare for the real thing. Our daughter has learned life lessons that support what we have been instilling and teaching her. She has matured and learned time management skills that will be significantly important in her senior year of high school and beyond." "This was the best summer program I have ever attended. It gave me an insight into college life by challenging me academically and socially. I learned how to manage my free time wisely and how to challenge myself academically. This program definitely prepared me for college and gave me a better perspective of college life." "The Summer Scholars Program provided our son with a tremendous opportunity for personal growth. He left the program more confident and mature. The change in a few short seeks was amazing. Living on his own with peers taught him to become increasingly self-reliant. Instead of approaching college with trepidation, he's looking forward to it." "College has been an intimidating topic because I was always unsure of what it would truly be like. This program has made me excited to attend college." "This Summer Scholars Program was absolutely amazing. I met so many new people and got to really experience what college life is like." "This program helped me decide what major I will choose in college, and what career I want to pursue. The activities helped me experience the correct way to balance a social life as well as an academic life." "The Summer Scholars Program was very beneficial. It reaffirmed by interest to to attend college in America, and it provided an understanding of what college can be like." "This program helped me get a view of college and campus life. I also was able to meet people with similar interests and study a subject that highly interests me." "I feel like the experience helped prepare me for college. I have a better understanding of what college will be like. Who I'm going to meet, how to do well in class, and what to expect at a major university. Most importantly, I know what will be expected of me as a student and a peer in terms of academics." "The Summer Scholars Program far exceeded our expectations. Our son had an amazing all-around experience and was particularly inspired by his professors' knowledge and passion. The program provides a priceless taste of the intellectual and social aspects of college life." "Overall, this program was the best experience of my summer. I feel much more prepared for college and have a better idea of what I actually want to have a career in. I know how to manage my time better also." "This program helped me to find out what dorm life would be like. I was worried about that part of college, since I'm so used to living in my own room without many other people around. However, I actually really liked living within the dorm and look forward to that in college. I was also worried about the workload in college, but after the program I know if I work hard then I can handle it just fine." "SSP gave me a taste of college life. 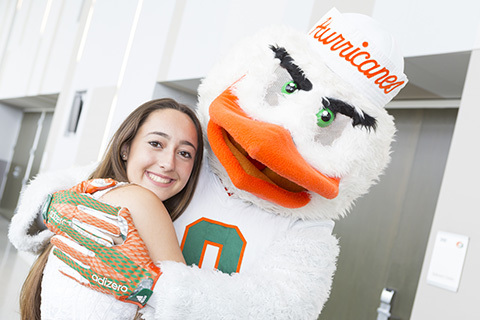 I got to explore the campus and activities U of Miami has to offer." "Best three weeks of my life!" "My perception of college was that it would be very hard if not impossible to balance school work and fun, but this program showed me that it is very possible to maintain your grades and have a wonderful time. The program was beneficial to my future because I now understand what is expected in a college setting and I am better prepared for it. The Summer Scholars Program was like a dress rehearsal for my actual college career and it made it easier to know what to expect. Now when I do start my freshman year of college I understand the basics of how things work and it removes some of the nerves and reservations I may have about attending school." "Going into SSP - I was really nervous. After the first couple of days, all of my fear had vanished. I do not regret taking these courses in the slightest. I am so proud that I challenged myself. It was truly an amazing experience and I feel very accomplished because of it." "I learned what it's really like to live in dorms on a college campus. I live in Miami, so I thought that even though I was a residential student, it would feel like I was at home: the opposite was true. Other than one visit, it felt the same way it would've felt had I gone halfway across the country." "This program gave me a preview of what life will be like when I am on my own at college. It also opened my eyes to other cultures and areas of the world from the friends I made. I now know what to expect when I go to college."